The weeks seem to be flying past again after a few months of every day dragging by slowly and I can hardly believe its been over four weeks since our holiday in Yorkshire. Last weekend, we were in Murton Park again for a core AscendancyLRP event and it was our first since we officially moved over to permanent crew (rather than the on and off crewing/writing we've been doing for the past few years). After a hard week at work and not much chance of it letting up next week, this weekend was about trying to chill a little. Yesterday we headed into town with a few bits of shopping to pick up, but also intending to drift around the shops and engage in some retail therapy of the lightest kind. Both of us treated ourselves to some things. In Dave's case it was orcs who I'm reliably are in the process of having their arms and legs hacked off, to transform them into orks. Yes... That's more yarn, picked up from Busy Fingers with making something for me in mind. 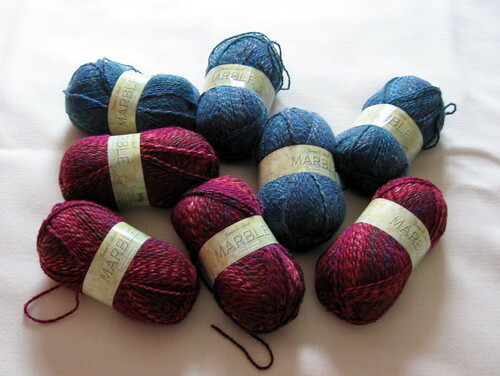 I've used the Brett Marble (Ravelry Link) before and love the way the colours come out; it's not at all expensive as yarn goes being an acrylic so is a cheap buy really. I'm hoping to turn it into a waistcoat and possibly a jumper or cardigan for me... I shall have to see how inspiration hits. And then I picked up these. Typically I haven't had more than a few minutes to myself to browse through these, but I spotted a new UK based sewing magazine called 'Sew' in Smiths. This is issue two, issue one having come and gone completely unnoticed by me, with a cover price of £5.99 which is a tad pricey. As is the tendency these days, it was wrapped in plastic so I couldn't get a look at it in the shop and I like to support new craft magazines and buy at least one issue, so I picked it up. Then we have Jane Austen's Sewing Box by Jennifer Forest, which isn't a book as purely based on sewing projects as the title might suggest. Instead it's a collection of projects, some sewn, some knitted, some netted inspired by Jane Austen's collected works. It's a book to read as much as a pattern book, with references to the books with each pattern along with historical information providing context. I had a gift token left over from Christmas and considered this to be a lucky find which I'm looking forward to reading. Not a bad haul I'm thinking.